OK, here’s the deal of the year for hunters. 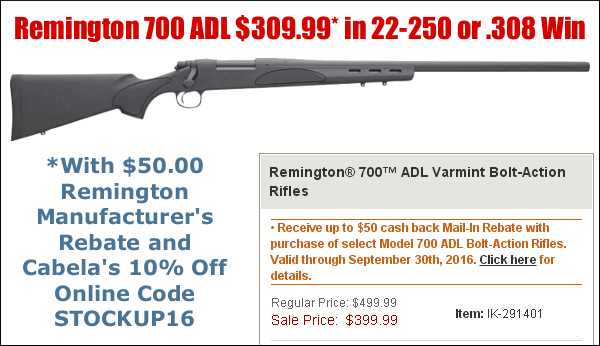 You can get a complete Remington 700 ADL Varmint Rifle in 22-250 or .308 Win for $309.99. That’s less than you might pay for a used Rem 700 action by itself. Here’s how it works. The current Cabela’s Sale Price is $399.99. Use online discount code STOCKUP16 to knock 10% off the price. That brings it down to $359.99. OK, there’s more — now through September 30, 2016, Remington is offering a $50 Mail-in Rebate on Rem 700 ADLs. When you get the $50.00 back from Remington, your net cost for this rifle is $309.99. CLICK HERE for Remington Rebate INFO. IMPORTANT: Remington $50.00 Rebate valid on purchases made from 8/1/16 through 9/30/16. All Rebate requests must be postmarked by 10/29/16. We’ve been looking for a jumbo, well-padded soft case like this for a long time. Something big enough to hold long-barreled match guns, with enough padding to protect nice finishes and enough room for tall scopes. 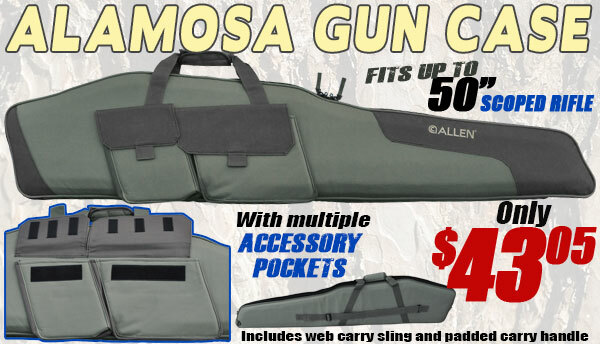 We are impressed with the new Alamosa Gun Case from Allen Company, which holds guns up to 50″ in length. We measured a 28″-barreled bench gun and this case was just big enough. If you have an adjustable buttplate, muzzle brake, or tuner, you might need a longer case (measure your rifle before ordering the Alamosa case). There’s a lot to like with the Alamosa case. The pockets are large and the shape provides plenty of room for big optics. You can purchase this case from Midsouth for $43.05, or from Amazon.com for $48.46 with free PRIME shipping. Cabela’s is having a big Sale on Firearms now, in advance of hunting season. You’ll find very competitive prices on rimfire and centerfire rifles. To make things even better, with a $99 minimum order you can get 10% Off plus FREE shipping with CODE STOCKUP16. This promo applies to ammunition as well (minimum order $99.00). If you need rifle, pistol, or shotgun ammo, the FREE Shipping offer can save you quite a lot. NOTE: This offer expires 10/2/16 at 11:59 p.m. (EDT), so place your orders soon. This is one of the most powerful, fast-charging USB-type power banks you can buy. Rated at 22000 mAh, it has 50% more “juice” than many units selling for around $35.00. This RAV Power machine charges up quickly and boasts three “intelligent” ports for optimal charging of smartphones, iPads, tablets, and other devices. After looking at a number of competitive battery banks, your Editor bought this RAVPower 22000 mAh unit to charge his own phone and iPad. 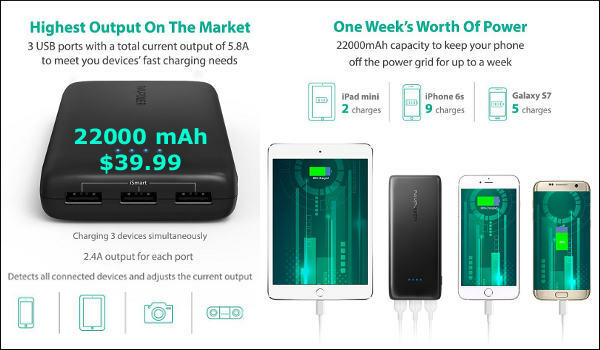 It can deliver a total current output of 5.8A (2.4A max per port), allowing it to charge two iPads and one iPhone 6s at optimal charging speeds. This unit can also power a LabRadar Chronograph for a full weekend of shooting (6-7 hours per day). Here is a very good deal on a decent 55-inch-high Stack-On Safe that offers a lot of capacity for the money. The claimed capacity is 24 long guns, that might work for smaller, unscoped rifles or shotguns. For scoped rifles, you might fit a dozen comfortably. There are convertible shelves that can hold handguns, optics, or other valuables. 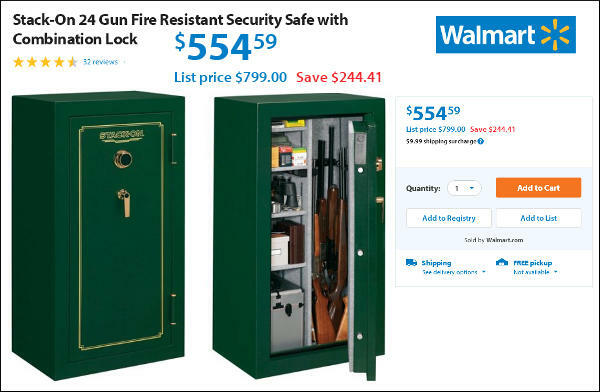 This safe will be delivered to your location — it is not available for in-store pick-up. Shipping surcharge applies. External Safe Dimensions are 55.00″ High x 29.25″ Wide x 20.25″ Deep. Shipping weight is 436 pounds. For pure plinking fun, it’s hard to beat rimfire shooting at reactive targets. We’ve used this inexpensive Rimfire Spinner target, and it has proven easy to set up and durable. We like the fact that there are three target diameters (3 5/8″, 2 1/4″, 1 5/8″) — that let’s new shooters get their confidence. You can set this spinner target close for pistols or at 50 yards with .22 LR rifles. This Birchwood Casey Target is also offered by Amazon.com for $19.99 with FREE Prime Shipping. Share the post "Bargain Finder 53: AccurateShooter’s Deals of the Week"